Yes, it’s that time of year when the BWAA submits their Hall of Fame ballots. It is a very crowded ballot with many deserving candidates this year. Despite that, with the writers unable to elect anybody to the Hal in 2013l, there is considerable consternation that only one or none of those on the ballot will be chosen, creating a tremendous backlog for the years ahead. That’s important if you (like me) are rooting for those on the fringe like Edgar Martinez, hoping to at least keep him on the ballot until the voters come around to his deserving election. There continues to be considerable discussion in the blogosphere about including PED users. I’m still a definite no on this. Barry Bonds, Roger Clemens, Mark McGwire, Sammy Sosa and Raphael Palmeiro don’t get my vote. I do not believe that someone who broke the law to fundamentally change the way the game was played for half a generation should be voted into the Hall. On Lookout Landing yesterday, Neil Weinman suggested there was some moral equivalence between PEDs users and DUI recipients. Yeah. Like there is some moral equivalence between those who jaywalk and commit murder or war crimes. Context is everything. Let’s not muddle this with unrelated comparisons to create some moral equivalence . Users broke the law to fundamentally change the game of baseball. Those who argue Major League Baseball is also responsible for the steroids era are right on. Bud Selig turned a blind eye to steroid use for a decade, and despite his contributions to the game, which are considerable, he should be out too. Donald Fehr of the MLBPA defended the players rights to continue using, he’s out too. These players knew that what they were doing was wrong, against the rules, and they did it anyway. They were fabulously well-paid. Their records remain on the books. They don’t deserve election to the Hall. At the very least not during their lifetime. Vote ’em in when they’re dead, but no celebrations, no speeches, no Hall of Fame weekend. Nail their plaques up in solemnity and silence. There are other players definitely worthy of consideration who could well fall of the ballot this year because it is so clogged with candidates. Larry Walker, Curt Schilling, Edgar, Trammell, Jeff Kent, and others. It just depends on how the votes get spread around, and how many voters choose the PEDs users, and how many send it ballots with less than ten choices, though I have a hard time seeing fewer than ten deserving choices. A couple of interesting articles appeared today. Ryan Divish posted on the Seattle Times Mariners blog, listing free agents still available. Before his list, however, he shared the Mariners were likely to bring back Franklin Gutierrez on an incentive-laden contract. They had him plugged in at center field. In another interesting post, Eric Blankenship at Lookout Landing shared his views and concerns about the Mariners defense, and that they desperately lacked a quality center fielder. Could Franklin Gutierrez re-join the Mariners as a partial solution to their center field vacancy? I’ve lamented the lack of serious center field candidate throughout this hot stove league, and its pretty clear that without any more quality center fielders on the market the M’s will have to be creative or run up the white flag. If the M’s were to sign Gutierrez to a stay-healthy-or-don’t-get-paid deal, it could be a partial answer to their problem. The Mariners need a right handed bat. Gutierrez is right handed. The M’s don’t want to get stuck with a deal for Nelson Cruz they’ll regret for years and years. I’m sure Guti gets a one-year deal. Depending on him to play center-field on a daily basis, however, is problematic, given his injury issues. I’d suggest it’s more likely he’ll play against left handers plus a day or two per week. Unless he’s traded, I would guess it’s likely the slack will be taken up by Dustin Ackley. Not my favorite move by a long shot, but at least it’s a step toward a more acceptable situation. I’ve made my feelings about Gutierrez clear: he’s too prone to serious injury to be counted on as a regular contributor. This isn’t a one year response, his problems have persisted over the past three seasons. There is no question that when he is healthy, his bat and his glove make the Mariners better. My concern, as always, is what happens when Guti goes down, and he almost certainly will. What is plan B. It seems to me the M’s are better fixed to fill in with Ackley, Saunders or Almonte, than they were last year with Saunders, Morse, Bay and Ibanez. Not a lot better, but not apocalyptically bad. All bets are off if two or more outfielders go down, just as it happened last year. The Mariners are in a tight spot when it comes to centerfield. Pickings were thin, and if they really wanted to make a splash, Ellsbury was an obvious choice. Now that would have been something, eh, Ellsbury and Cano? Moving past that, Gutierrez joining Saunders, Ackley, Hart and Almonte in the outfield sounds better than going with Nelson Cruz or going without any outfield reinforcements. With Gutierrez, Hart and Ackley likely sharing at bats at other positions, it’s a suggestion that has merit. 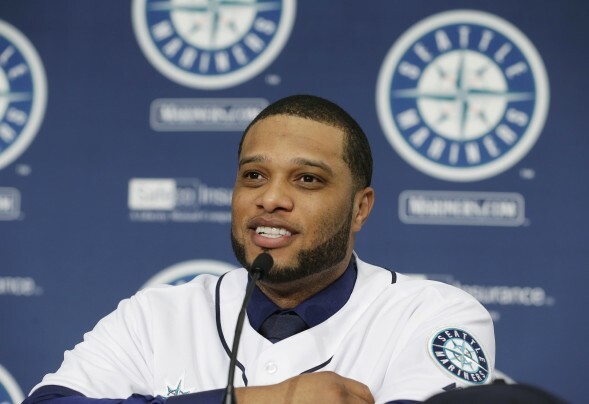 Yesteraday the Mariners made it official, Robinson Cano joined the team. Today the M’s gave Cano a little protection in the batting order by welcomingg Corey Hart and Logan Morrison to the team. Robinson Cano is a great signing. At least today, he is a wonderful acquisition. He is a middle of the line-up hitter-high on-base, high average, high slugging percentage-who is also a good defender. Though he displaces other players, notably Nick Franklin and Dustin Ackley, he is the best player at his position in baseball and it’s hard to argue that he makes the Mariners incontestably better. It is likely that some time down the road his contract will not be something of an albatross, but that’s a discussion for another day. Robinson Cano at his press conference with the Mariners. I’m not sure how Hart and Morrison move the team forward. Hart is a big right handed power-hitter, who in the past was capable of 30 homer seasons. Morrison a lefty, with less success in the bigs at the plate. However they are both guys coming off knee injuries. They are relatively ineffective outfielders, best suited to play at DH and first base. I mean no disrespect. Hart could light the world on fire, hit his 30 homers and sign a big contract with M’s or somebody else next year. Morrison will at least entertain the fans on Twitter, and will hopefully have some success at the plate too. But I am troubled that these players, mediocre outfielders before their knee injuries, are somehow going to offer adequate defense in Safeco’s big barnyard. I remember this story last year. Trade for Mike Morse, mix in a little Jason Bay, cover with Raul Ibanez, sprinkle with some magical Franklin Gutierrez dust, and voila! Mariners outfield. There are still a lot of holes to fill. Though there is still plenty of time until Spring Training, Zdurencik has done nothing to address the team’s pitching problems. Though noises were made about a trade for David Price, and teams are waiting for the dust to clear regarding the Masahiro Tanaka posting (or not) the Mariners must make an add to their rotation. On the Price for Taijuan Walker question, do you do it or not? If the Mariners are looking to win now, of course, you make the trade. I’m not convinced that’s their plan, but if they are serious about contending you make a deal that includes two former Cy Young winners in Felix and Price and a Cy Young contender in Iwakuma, plus whatever else. That’s the best rotation in the major leagues. Their bullpen ended the year a shambles, and multiple pieces are necessary to plaster together a relief staff that lost more games than any team in the American League. Leaving aside the pitching issues, which will hopefully get sorted out, I question that Zdurencik has a big picture vision for this team. Safeco Field is a pitcher’s park, and it should be built with that idea in mind. Mariners teams should be built around great pitching and an athletic, effective defense, and an offense that values getting on base and running like the wind. Robbie Cano fits this perfectly, but depending on home runs from a right hander in a park that will always rob one dimensional hitters of their power seems like a mistake to me. Last year, Zdurencik left Arizona with a perpetually injured centerfielder, and was forced to use players either too old or too ineffective to play the position. The result was poor outfield defense that sabotaged the pitching and contributed significantly to the team’s 91 losses. Today the Mariners have exactly one oufielder with a year’s major league experience, Michael Saunders. One more if you count utility player Willie Bloomquist. If they don’t trade him, the M’s are likely to shuffle Dustin Ackley into an outfield spot, leaving at least one big hole. This team desperately needs a talented, veteran center fielder, and no number of Corey Harts, Logan Morrisons, Jason Bays or Raul Ibanezs can change that. Michael Saunders is not a center fielder and Dustin Ackley should not be. Pieces are available to trade for Brett Gardner or Denard Span who don’t hit home runs but are first rate defenders. That the M’s may be considering returning Gutierrez to the team is just ridiculous. The scrap heaps and bargain bins are not a place to be looking for one of the most important players on the team. Good teams have good ones, and great teams have great ones. My fear is Jack Zdurencik simply sees this team as a collection of pieces. Cano gives them a superstar. Hart gives them a right handed thumper. Felix is the face of the franchise. Kyle Seager and Brad Miller are the gritty young up and comers. But this is not Major League IV: Hope Springs Eternal with the wily veteran pitcher and the flame throwing righty, the catcher with a heart of gold, and an amazing young centerfielder. This is not a team in which the bits all fit together well. There are missing parts, and it fails to take advantage of the number one unchangeable feature of the Seattle Mariners and that is the vastness of Safeco Field. I will not be duped by the lure of the longball and I am not convinced that Zdurencik has a clue. That’s an easy answer, it’s gotten me in front of MLBnetwork’s coverage of the Winter Meetings, I’m constantly updating my open MLBRumors.com tab. I paid for insider status at ESPNmlb. If the M’s wanted to get fans energized and excited about baseball, it worked on me. That the M’s were linked to lots of big names like Matt Kemp, Shin Soo Choo, and David Price is great. Word came across a few minutes ago that the M’s signed right-handed first-basemen/right fielder Corey Hart to a one year deal. Hopefully more deals are coming. Based on information coming out of Orlando today, the Price and Kemp deals are less likely to happen. The Rays want young first line prospects and plenty of them for Price. Jack Zdurencik has said he won’t trade Taijuan Walker, which was said to the be asking price for the Cy Young pitcher. Further, Price’s agent, Bo McKinniss announced that while Price would be willing to negotiate an extension with some teams, the Seattle isn’t one of them. Thus, if the M’s dealt for him, they are only guaranteed the two years until his free agency. A steep price to pay. Today the Dodgers announced they’ll likely hang on to Matt Kemp. The oft-injured center-fielder, still in an ankle boot at this time, is owed $21 million a year for each of the next six seasons. It was hoped that for the right combination of prospects the M’s might be able to pry Kemp loose with the Dodgers kicking in a portion of his salary. Kemp would have been another right handed bat who has played center-field, but it remains to be seen whether he could continue playing at his peak level, or if he would suffer a sharp decline, or simply be plagued by injuries. This doesn’t mean neither of the deals can be worked out, but there are certainly some down-side risks to the Mariners. However, the news the Mariners have signed Corey Hart is very positive. Hart played right field and first base before missing all of last year recovering from knee surgeries. 2012, the last season Hart played with the Brewers his slash line was .270/.334/.501 with 30 home runs and 35 doubles. Defensively, Hart has been a pretty average player according to both UZR and the Dewan system, with slightly above average range and a slightly below average arm. He also played a lot of 1B after the Brewers lost Prince Fielder in 2012. Honestly, he wasn’t a great defender there. He does actually present an interesting problem for Mariners, assuming there are no further moves. They could play Hart in left field and move Michael Saunders to right, where Saunders has the better arm. They could decide to move Justin Smoak in a trade, putting Hart there, hopefully a year wiser in the playing first base department. This gives the M’s a somewhat valuable chip to trade., and still leaves a corner outfield spot open for Shin Soo Choo, if the M’s take the plunge on him. There’s still the matter of center field. With the Yankees glut of outfielders, and lack of a second basemen, Brett Gardner may be available (and we now seem to have a raft of second basemen.) The Blue Jays say Colby Rasmus could be available for a pitcher. Still money to be spent and trades to make, though I’m not always sure Jack Z. knows how to make the right ones. Cano and Hart are in the tank, and both were good moves. It’s hard to see the Cano signing as anything but good. It’s 2013, hardly 90 days from 2014 spring training. It’s been nearly a decade since this team was relevant in a pennant race. In that time there’s hardly been a flicker of life. The long good-bye to the heroes 1995 and 2001 is a generation old. Reactions are coming fast and furious to the Mariners’ signing of Robinson Cano. At a rumored $240 million, it is the third highest total contract amount behind A-Rod’s 2001 contract with Texas and Albert Pujols’ signing with the Angels. Lots of descriptors like overpay, desperate, and ridiculous appear willy-nilly among commentators and bloggers to describe this. Writers will compare dollars, analyze WAR, they will compare Cano to other second basemen and free agent signings, decline curves with many comparisons to Albert Pujols. Pointless. There are only two numbers the dozen or so remaining Mariners fans need to remember: 71 and 92. 71 is the number of games the Mariners won last year. If Cano moves the Mariners higher on the win scale, it’s a worthwhile signing. New York fans are right to be angry about Cano’s defection to the Northwest. I know how I felt about A-Rod leaving for the bucks, and how I continue to feel about him. Hopefully our new second baseman won’t be quite so disingenuous in his comments to the press. Yes, they can be pissed, but don’t buy for a moment that Cano isn’t a great player and that he won’t help this team get better. He is a legit middle of the order hitter the Mariners have been missing. But it isn’t enough to just talk about wins and losses. Cano’s signing and those I presume will follow represent a gesture of good faith. It is a sign to other desirable free agents the Mariners management has removed their heads from their posterior and may be charting a path toward winning again. Maybe it will give other desirable pieces a sign that it’s worth listening to offers from the upper left corner. Just as importantly, it is a sign to we long suffering fans that management has awakened from its long slumber, have found their wallets in Ebeneezer Scrooge’s basement, and are now prepared to augment the mediocre talents of their team with proven veteran talent. If the spending ends with Cano, all bets are off. But if they build a real lineup around Cano, we’ll have something to cheer about. The work isn’t complete yet, but nobody should suggest the Mariners’ haven’t taken a first step toward competition.